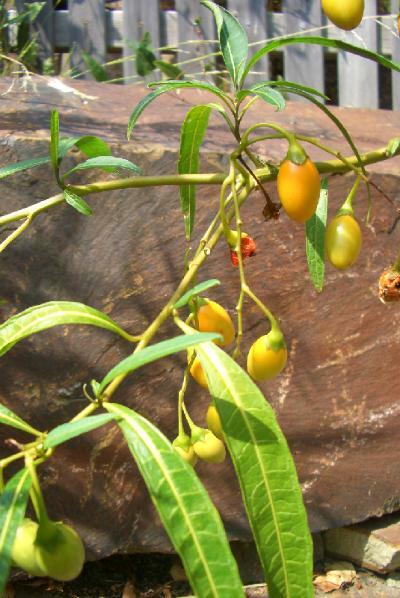 Kangaroo Apples grow well in our park and can grow from seeds independently of us! It is called Kangaroo Apple not because kangaroos eat the fruit but because the leaf shape is reminiscent of a kangaroo's paw! Flora of Melbourne tells us that Aborigines did apparently eat the fruit but only when it was very ripe. They often placed them in sand heaps to ripen. It is a decorative shrub which becomes straggly with age but is easily rejuvenated by pruning. The flowers are an attractive purplish colour and seem to be visible for quite a long time. This photo shows some Einadia nutans with berries sprawled across some Lomandra leaves and mingled with a Correa bush. That is its habit, to grow under and over anything in its path. When we first planted it in the park it behaved like a weed and we were concerned. Darcy Duggan reassured us that this was only how it behaved in its early days and this has proved to be true. This is a new one growing near the big bridge. Flora of Melbourne describes it as a "useful groundcover for dry banks and rockeries, drought resistant once established. It is also a valuable fire retardant. Propagation is by cuttings"
Spiny Mat Rush, in South Surrey Park in 2012. Lomandra is a very hardy plant which grows in a variety of situations, particularly in sandy soil. Flora of Melbourne says that it requires well drained soils and tolerates dry shade. It is being used for road plantings in Victoria but is also a useful plant in a garden setting. Aborigines at Lake Condah and other places used the leaves to make baskets and eel traps. At Lake Tyers they are still making baskets from Lomandra leaves. Seedlings are available at Greenlink. Flora of Melbourne tells us that banksia nectar was used to make drinks by the Aborigines. Paint brushes came from the stamens. It is a small tree growing to between ten and twenty metres and is five to ten metres wide. Flora of Melbourne describes it as "a sturdy ornamental windbreak with rough bark which can become gnarled and fissured with age." Flora of Melbourne states that this is "a variable dense upright to spreading shrub" which is "an attractive, easily grown shrub, ideal as a low screen". It is "tolerant of lime" and likes well drained soils. It can be grown in the garden, as it grows happily in full sun and dappled shade. It can be grown from cuttings and also pruned into a neat hedge for a more formal garden. 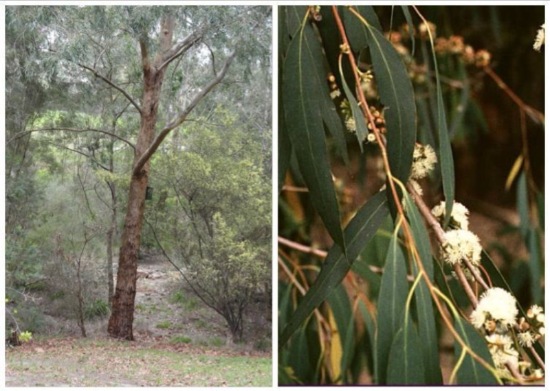 Here is our Eucalyptus radiata mentioned by Dr Lorimer and another photograph from the Morwell State Park website of the flowers and leaves. This tree is in the park below Anderson Street. Eucalyptus radiata is widespread in damp and valley sclerophyll forests, sclerophyll woodland and grassy, low open forests. It can grow up to 30 metres tall and is a graceful, upright tree which provides shade and shelter. (Flora of Melbourne). A Melbourne pharmacist, James Bosisto was the first to commercially utilise eucalyptus leaves as oil in 1854. It has many uses, both medicinal and domestic. It is very good for removing the gum sticky labels leave behind. Aboriginals used the leaves for medicine. I like this account by Dame Mary Gilmore. A steam bath was created by digging a pit and filling it with fire so that it became hot. The fire was removed and the pit lined with eucalyptus leaves. These were covered with possum rugs and the patient lay inside while the steam eased his rheumatism.